VR was a highly discussed topic at the ITB conference, so on Friday we decided to visit the keynote panel discussion “Virtual Reality – Marketing Power Tool Or Industry Threat?”, moderated by Dr. Michael Gerards (Founder and Executive Director, present4D). 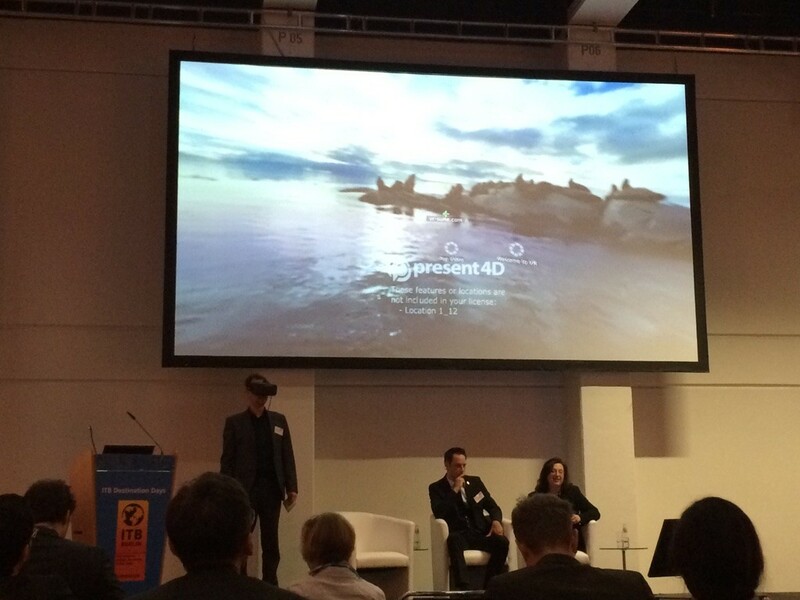 After Dr. Gerards gave a general overview about VR, how it works, and possible fields of application in tourism, the panel guests Maria Greene (Director, Overseas Marketing, Destination British Columbia) and Ronnie Paetow (Director of Sales & Marketing, Radisson Blu Hotel Hannover) shared their knowledge and experience about VR production. According to Maria Greene, a big challenge they faced in 2014 were the huge investments. During the last year, technology has developed immensely, and nowadays the same production would most likely not cost more than 1/5th of what Destination BC invested originally for their VR video The Wild Within. To bring that into specific terms, back in 2014 the cost of production for the 20 min video was $400.000 – $500.000. Similar productions can now be realized with approximately $35.000 – $75.000. She also filled us in about Destination BCs endeavor to publish a VR clip with skiing experiences in the near future. For Ronnie Paetow and his team at Radisson Blu Hotel Hannover the preparation phase was very important, as the biggest challenge for them was the procedure of recording. With a “regular” 2D video one is able to see the results directly after the shooting, whereas with the more complex shooting for a VR production, the results can only be examined after the stitching process is completed, making the producers somewhat blind during the filming. Both Maria Greene, as well as Ronnie Paetow, do believe in VR as a marketing power tool, as it offers new possibilities to showcase an intangible product, to trigger emotions, and to get closer to potential customers. None of them considers VR as an industry threat, as in their opinion the technology will never replace the emotional experience of real travel. A virtual trip cannot substitute smell, taste, or meeting new cultures. However, they agree that VR productions will be the new image video standard very soon. Dr. Gerards also informed us about the fact that in just the last 12 months, more than one million VR videos have been filmed. While this number is not limited to tourism, it does give a great impression about the impacts VR already has. Do you fear that VR is a threat to the industry? Or do you see great potential and you have been already involved with VR production? Share your thoughts with us! Want to find out more about the risks and benefits of VR applications? Check out this chapter in our overview of VR in tourism and get an academic persepective on things. Julia discovered her interest in the field of eTourism during her master program at UoAS Salzbug. She is fascinated how fast technology develops and finds its way to tourism. Julia wrote her master thesis on the topic of "Virtual Reality as a tool to trigger emotions in tourism marketing" and investigated the impact of VR with subjective as well as objective measurements.